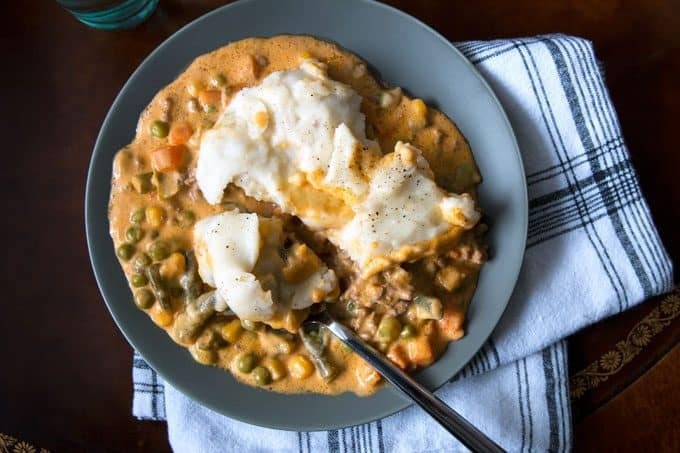 Slow cooker shepherds pie is a great year-round dinner. It only takes 3 hours to cook, is flavorful, and very filling. Meaty, cheesy and full of veggies – your whole family will love it! St. Patrick’s Day just passed and it got me thinking. Why don’t we enjoy “holiday” foods on a more regular basis? I could go for some good corned beef and cabbage on a daily basis. Also, shepherds pie. 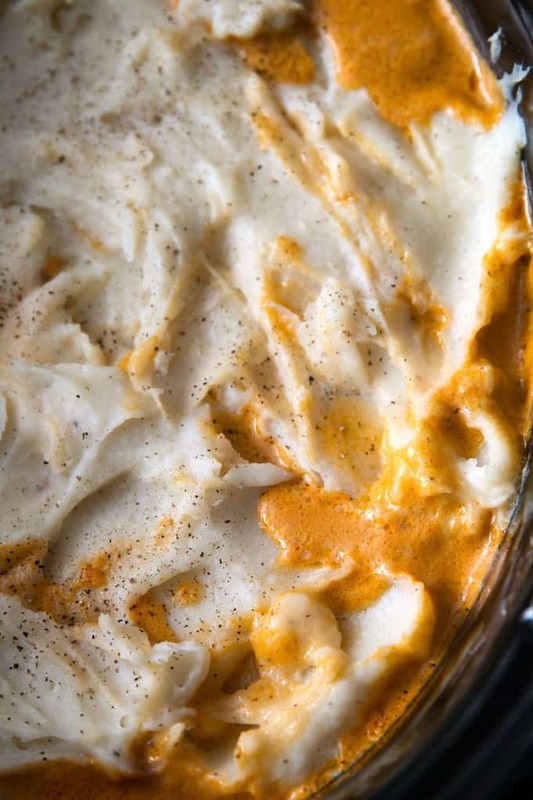 We can’t forget about shepherds pie. All of those delicious flavors in one meaty meal get my mouth watering. I don’t like to turn my oven on in the summer and that is one of the main reasons I won’t make shepherds pie in the summer. My slow cooker however gets taken out of the pantry and used weekly during the hottest months. 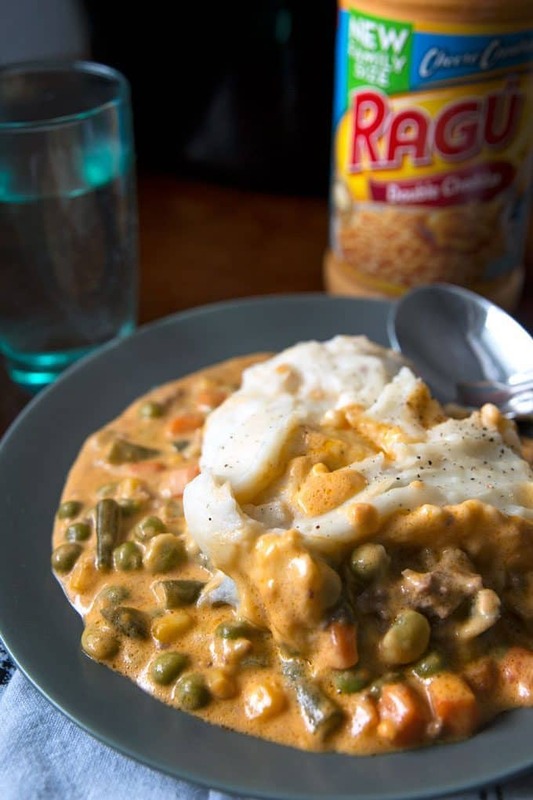 Making shepherds pie in the slow cooker is incredibly easy. It’s not quite a dump recipe but it is pretty close. And the easier a recipe is to make, the more likely I am to make it. Start with some ground beef and a bag of frozen mixed vegetables. You can use any type of mixed veggies but I usually stick with a classic blend of green beans, carrots, corn and peas. The next part is my favorite part – the sauce. 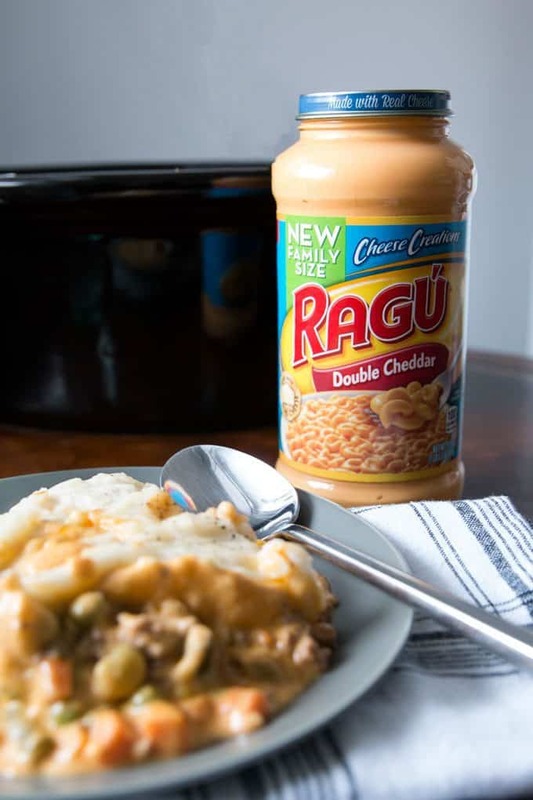 I use RAGÚ® Family Size Double Cheddar Sauce every time I make slow cooker shepherds pie. It features cheddar, parmesan, and Romano cheese and is perfect for Mac & cheese. It is great anytime you need cheese sauce! 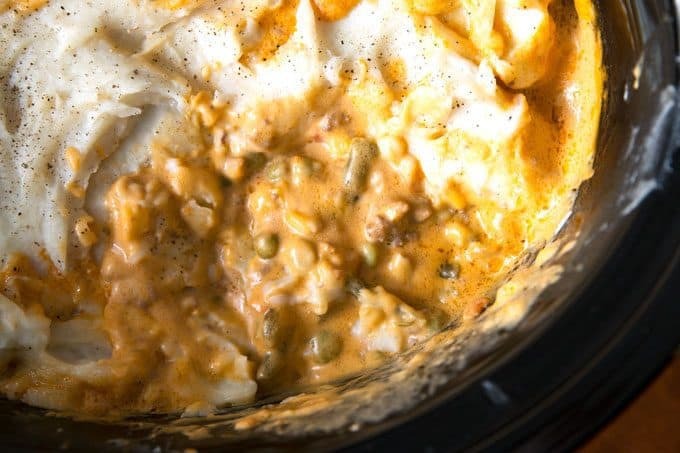 Pour the RAGÚ Family Size Double Cheddar Sauce onto the vegetables and place the lid onto your slow cooker. Set it to 3 hours on high and then go about your day. When the timer goes off, remove the lid and give the mixture a really good stir. Make sure that you combine the cheese with the vegetables and meat – every bite should be cheesy. Then top the whole mixture with hot mashed potatoes. If I am in a hurry, I will use instant mashed potatoes. If I have some extra time, I will make a batch of homemade mashed potatoes about 30 minutes before the slow cooker’s timer goes off. And that’s it. You are ready to serve your shepherds pie. With a recipe this easy, I bet you serve this for dinner at least once a month! Slow cooker shepherds pie is a great year-round dinner. It only takes 3 hours to cook, is flavorful, and very filling. Meaty, cheesy and full of veggies - your whole family will love it! In the base of a large slow cooker, place one pound of ground beef. Break it up with a spoon. Add the mixed vegetables on top of the meat. 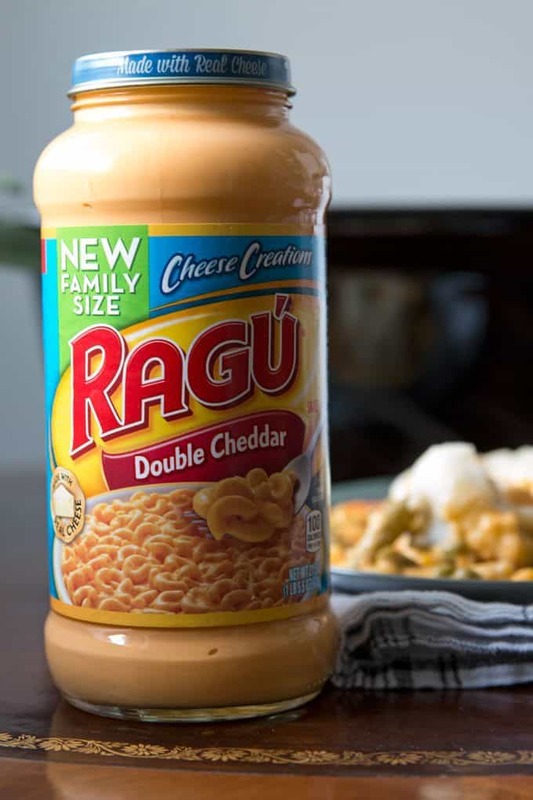 Pour a full jar of RAGÚ® Family Size Double Cheddar Sauce on top of the vegetables. Place the lid on the slow cooker. Cook on high for 3 hours or low for 5 hours. When cooking has completed, remove the lid and stir the mixture to combine. Season to taste with salt and pepper. 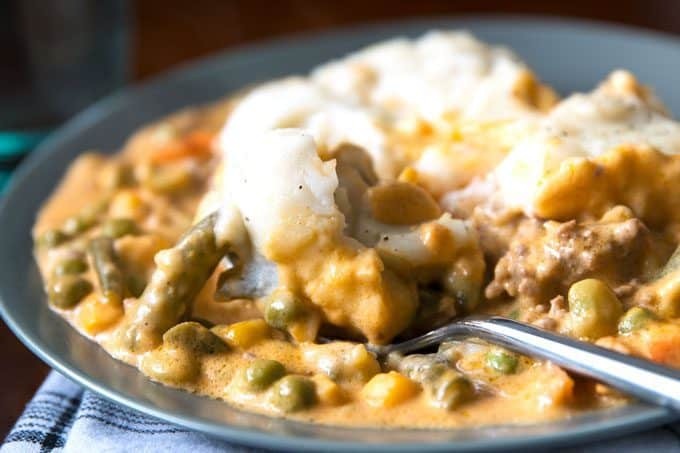 Spread the hot mashed potatoes on top of the cheese, meat, and vegetable mixture. Allow to cool 20 minutes before serving. 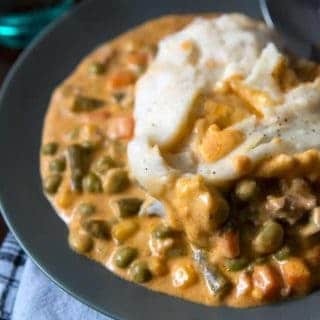 I love a good slow cooker meal! This looks delicious! One of my favorite meals! I’ve never tried it in the slow cooker before!